This addon for SourceMod on a CS:S server provides a lot of bug fixes and great enhancements for the mg_piratewars map. It's a must-have for any serious Piratewars server, because it finally gets rid of all those annoying bugs and provides a much more elegant interface. 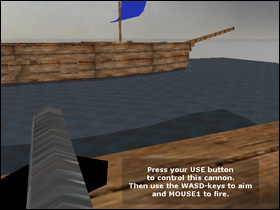 The cannon- and boat-controls no longer enable upon stepping up to them, but upon press of the players USE button. This prevents them from activating accidentally, should a player run through the trigger zone. Also, if a player somehow moves or falls out of the cannon's or boat's control area, the controls immediately disable so that the player can move again. The bug where players who die while driving a boat or controlling a cannon are stuck in spectator mode with their knife displayed (and still able to control the cannon/boat while dead), is also fixed. If a player dies like this, or even disconnects, there is no issue at all, and the same boat/cannon can immediately be used by another player again. The cannons also disable the moment the ship they are on starts to sink. Furthermore, the plugin makes the rescue boats indestructible, and adds reverse-driving capability. 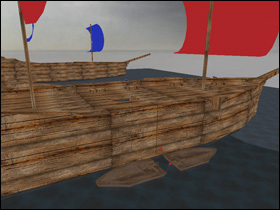 It also makes the boats stop driving if a player leaves without having released his move buttons - previously, this caused the boats to simply keep on driving. Disabling the controls is just as easy as activating them - the player simply has to press his USE button once (and really, just once) again. No need to hammer it and the jump key anymore, hoping to get off. Due to the buggy implementation of the game_ui entity, the setup this plugin provides is impossible to be created by mapping alone (Thanks to the famous game_ui deactivation crash). Thats why this plugin takes over a lot of the original game_ui functionality like freezing the player and taking his weapon, and executes these tasks much more reliably. This whole principle may also be adapted for other maps that make use of the game_ui. All that is required is a trigger_multiple which the player has to touch in order to be able to activate the interface. The plugin does not have any configuration options. If there is anything you wish to change, please take a look at the - very well commented - source code, and make the modifications yourself. The plugin binary has been built for SourceMod version 1.3 and up.